Free markets have a common point: prices are steadily changing. Sometimes they go upwards, sometimes they go downwards. Experts and analysts try to find a rule in these continuous changes. This rule is the trend. 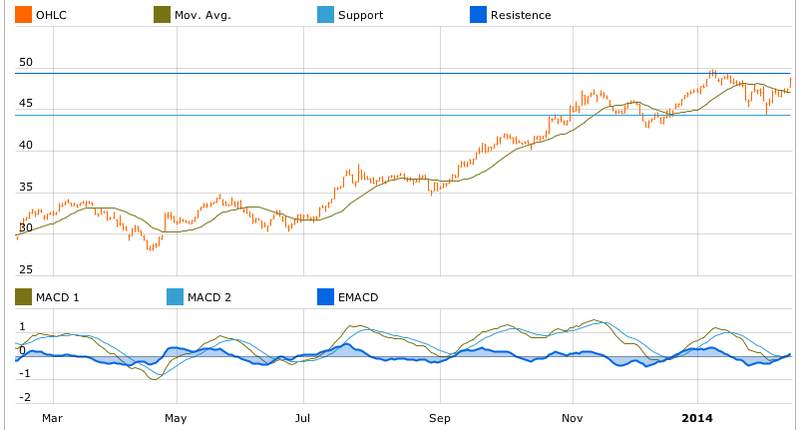 The trend is the general direction of the stock (but it is also applicable for other listed assets, as ETF, funds or bonds, for instance) in a period of time. The investors’ profile and style will guide which time frame is important: for daily traders, they take into account short term trends, while a more traditional investor, who is saving for a long-term goal (studies for his or her children, retirement), the point is the tendency in a wider period. If we consider a medium or long-term trend, the options are from very bearish to very bullish. In other words, from a strong downwards trend to a strong upwards trend. The middle point is the lateral movements, when the asset has no clear tendency. 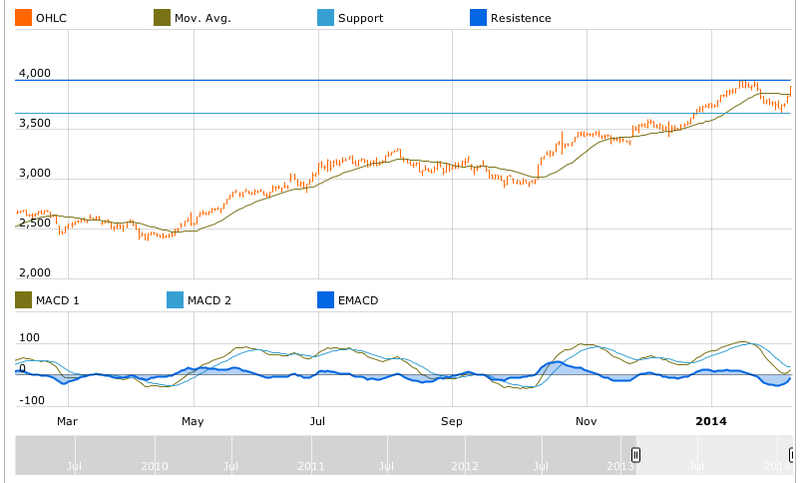 In T-Advisor we consider the trend analysis as an important figure to take investment decisions. Our system has established a code with three arrows. Each arrow sums up the trend of the last three weeks. Sometimes, there is a combination of up and down arrows, which help the investor detect a change in the direction and react to the market movement. To complete the trend analysis, it is necessary to know if it is strong or not to be prevented about how long it will probably last. The word “probably” is quite important. Analysts consider that the market has a cyclical behaviour and it repeats the movements every certain time, but the base is probabilistic: it could happen or not. The trend strength is the slope of the main trend. In this case, the analysis considers a long-term direction, avoiding taking into account short-term changes. The higher is the number, the strongest is the trend. 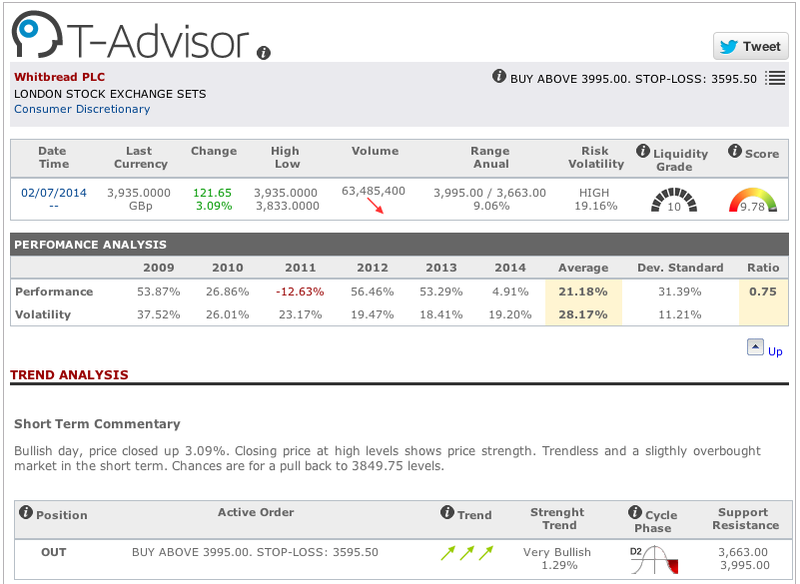 In T-Advisor, this data completes the analysis of the trend signalled by arrows. This entry was posted in T-Advisorpedia and tagged bearish, Bullish, trend on February 27, 2014 by Oscar Garcia. Internet sector has a recent history but the shares are always a question of interest amongst investors. There are many examples of successful and failed companies. Currently, social networks are trendy: think about the launch of Twitter in New York. However, only Facebook is the only one in the top 4 of Internet companies focused on social networks. The others have other sources for revenues: Google, Amazon and Ebay. Amazon is the biggest internet store. In 2013 the company increased 22% its sales to $74.5 bn and the net income reached $274 million ($0.59 per share). Google is broadly known by its popular search engine, but it develops a wide range of internet, software and technological solutions. The sales increased in 2013 a 20.5% to $55.5 bn and the net income jumped to $12.9 bn ($38.13 per share). Facebook is the biggest social network and it announced last week the buy of the messenger system Whatsapp. The revenues in 2013 totalled $7.8 bn, a 54.6% more. The net profit increased to $1.5 bn ($0.80 per share). Ebay is the biggest auction platform in Internet. It is also the owner of the payment system Paypal. The net revenue in 2013 was $16 bn, a 14% more. The net income reached $2.8 bn ($0.19 per share). 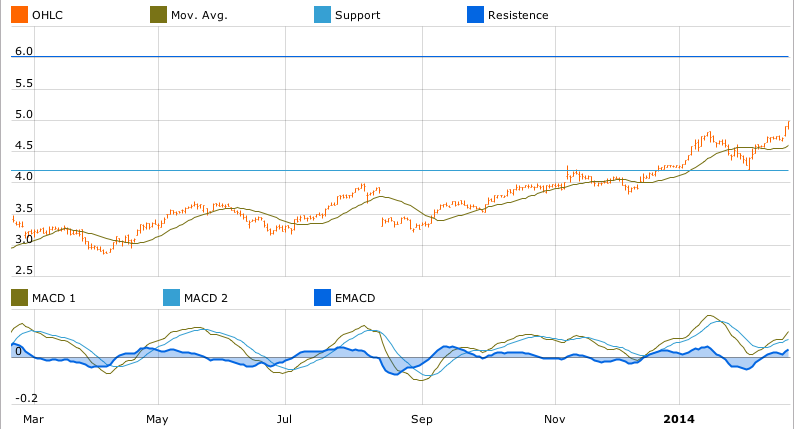 Recent Facebook buy has not hit the share. On the contrary, it has the best performance YTD amongst the top group. 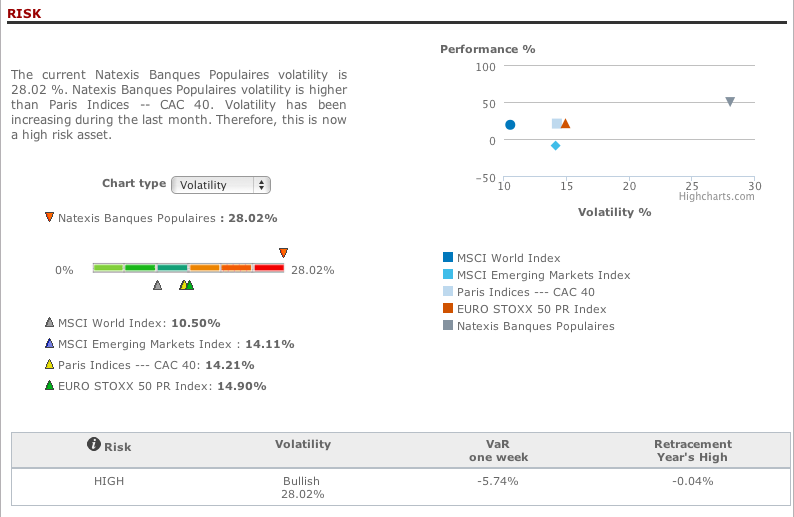 However, it is very volatile and risky, as the VaR shows. 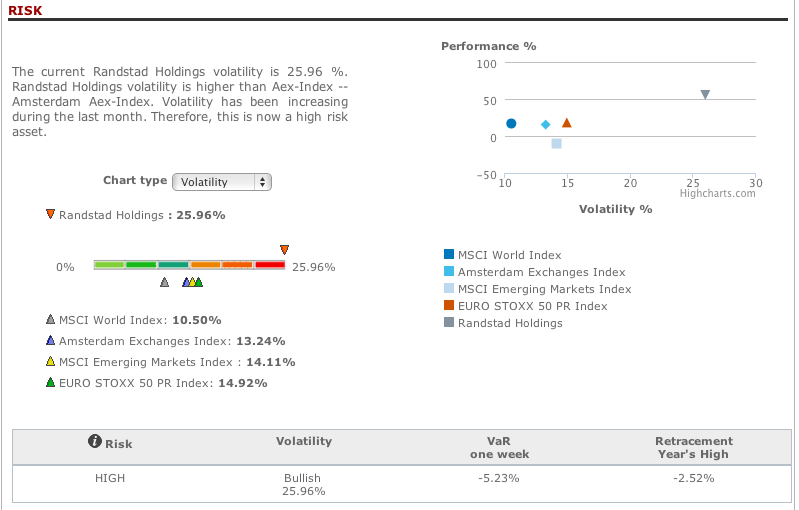 The least risk is for Google, which has a good performance YTD with a moderate volatility. Amazon and Ebay have not begun the year positively and the score registers also this fact. This entry was posted in News and tagged amazon, ebay, facebook, google on February 25, 2014 by Oscar Garcia. T-Advisor, through its tool Market Opportunities, has detected the company Natexis, listed in Euronext Paris as an opportunity for investment. Natexis Banques Populaires is part of the Groupe Banque Populaire in France, the second largest banking group in the country. Its core business are wholesale banking, investment solutions and specialized financial services. The net profit in 2013 reached €1,12 bn. This entry was posted in Market Opportunities and tagged Investment, Natexis, Opportunity on February 24, 2014 by Oscar Garcia. When we were students, we received marks from the teachers in the exams. Sometimes it went fine, others not so good. In any case, the mark was an easy reference to know if we had passed or not. Why not using it in personal finances? 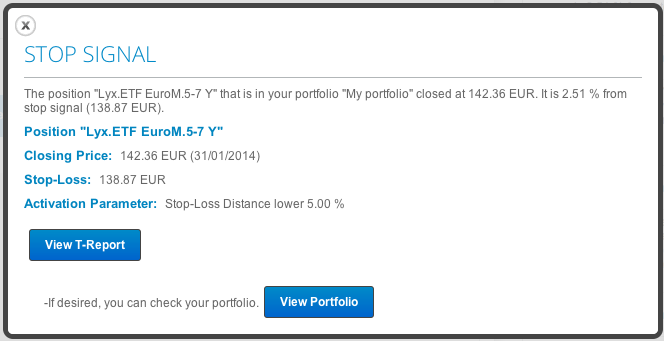 That is the portfolio score in T-Advisor. T-Advisor, as software mainly thought to control and organize individuals’ investments, was designed to be easy to understand for everyone, either the person had deep financial knowledge or not. We conceive the portfolio score as a personal reference that reports about the quality of our investments related to some measures. The marks are between 0 (the worst) and 10 (the best). Diversification: the more diversified portfolio with more positions, the better, as you reduced your risks. 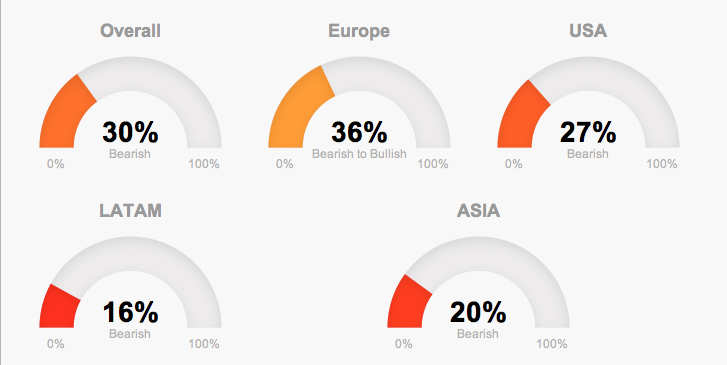 Trend: a good score has a bullish trend, against a sideways or, even worst, a bearish. 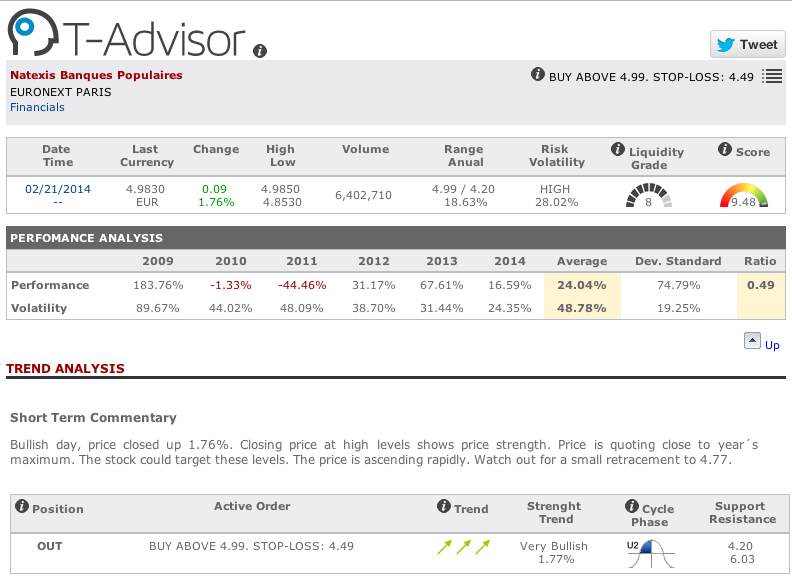 Risk: T-Advisor compares your risk profile against the general portfolio risk. The system defines a risk range for every profile. Think about you are conservative and your portfolio risk is high: something goes wrong and you receive a low score. 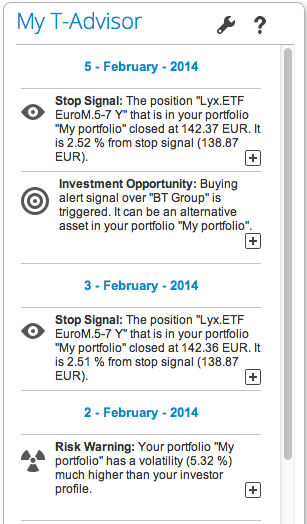 Performance: as before in risks, T-Advisor establishes a range for the investment profile expected return. If the portfolio return is in it, it marks. If the return is nearest to the highest point in the range, your mark will be also higher. T-Advisor suggests the investor possible improvements in every measure. For instance, as we see in the picture above, it recommends a review of the bearish positions. How can the T-Advisor user find new investment ideas? Searching in our “Market opportunities” tool or looking at in every position report (our T-Report) some alternatives that the own system suggests. Create your own portfolio and discover these tool functions! 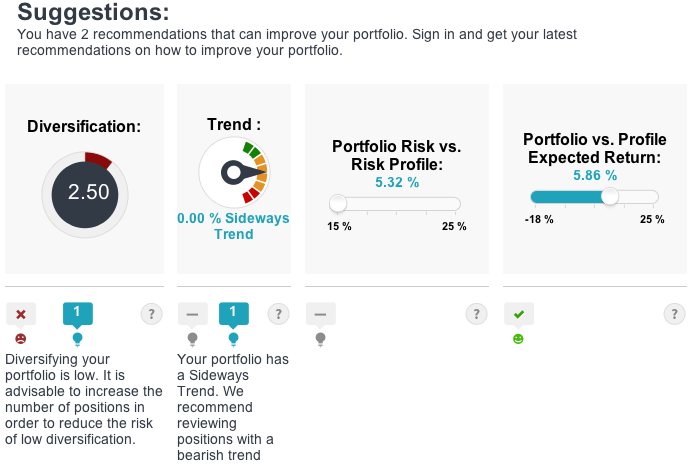 This entry was posted in Discover and tagged Diversification, Performance, portfolio score, risk, trend on February 20, 2014 by Oscar Garcia. Current investors face a situation in which they have an enormous variety of assets. Information provides the data and figures to choose the opportunities that fit their profile. Basically, investors have two market positions linked to the assets: they bought some or they have nothing. This basic difference is important to understand further developments in the investors’ decisions. If an investor is in a LONG position, it means that he or she owns that assets. If he is in an OUT position, he has no shares or participations, depending the kind of the asset. Both situations are not static. Investors always follow the market and their asset performance. The worries about their investments are not the same: if they have a LONG position, they pay attention if the asset has a positive trend or not related the entry price. On the opposite, if they have an OUT position, the interest is focused in when the asset has an interesting price to buy. If the investor has a LONG position (he or she has the asset), the possibilities are HOLD LONG (keep the asset, because the trend is positive) or SELL (below a specific price). If the investor has an OUT position (he or she has nothing of the asset), the possibilities are WAIT (do not buy, because the price trend is negative) or BUY ABOVE (the trend is positive and the investor gets the price in which it is interesting to enter). Investment behaviour depends on the initial position. Investors should have available a reliable tool to follow the trading signals linked to an alert system that provides the chance to react immediately in the market. This entry was posted in T-Advisorpedia and tagged Long, Out, Position, Trading signal on February 18, 2014 by Oscar Garcia. T-Advisor, through its tool Market Opportunities, has detected the company Randstad Holdings, listed in Euronext Amsterdam as an opportunity for investment. Randstad Holdings is the second largest company in the world specialised in human resources services. Apart from temporary staffing, permanent placement and the recruitment of middle and senior managers, the company also offers inhouse consultancy and specialised human resources services. It is expanded in 39 countries and its revenue in 2012 was € 17.1 billion. This entry was posted in Market Opportunities and tagged Investment, Opportunity, Randstad Holdings on February 17, 2014 by Oscar Garcia. PIIGS, dirty or pata negra markets? It is already a bit long time since the beginning of the (still) current financial crisis, when Lehman Brothers declared on bankruptcy and panic rushed into the stocks exchanges. The wave, or much better tsunami, affected deeply all the world, but southern European countries and Ireland (the celtic tiger) suffered the hardest consequences: Portugal, Ireland and Greece were bailed out, Spanish banking system was also bailed out and Italy stood close but finally avoided a troika indirect government. The acronym PIIGS, from the initials of these countries, emerged again, pointing them contemptuously. Their stocks exchanges experienced a big fall of, at least, two thirds of their value from the highest point to the lowest, as our table shows. All of them presented cheap prices. After the worst part of the crisis, PIIGS show now positive signs in their economies and capital flow again, but prices are still cheap. This result repeated in January: Spain and Portugal were the whole month in the top 3 and Italy amongst the 5 more bullish. “PIIGS can fly”, said recently an analyst quoted by AFP, although the sentence is not new, as some comments focused already in that way last October. However, uncertainty remains in these countries. Portugal and Greece are still indirectly ruled by the troika, while Italian and Spanish growth outlooks are still weak. 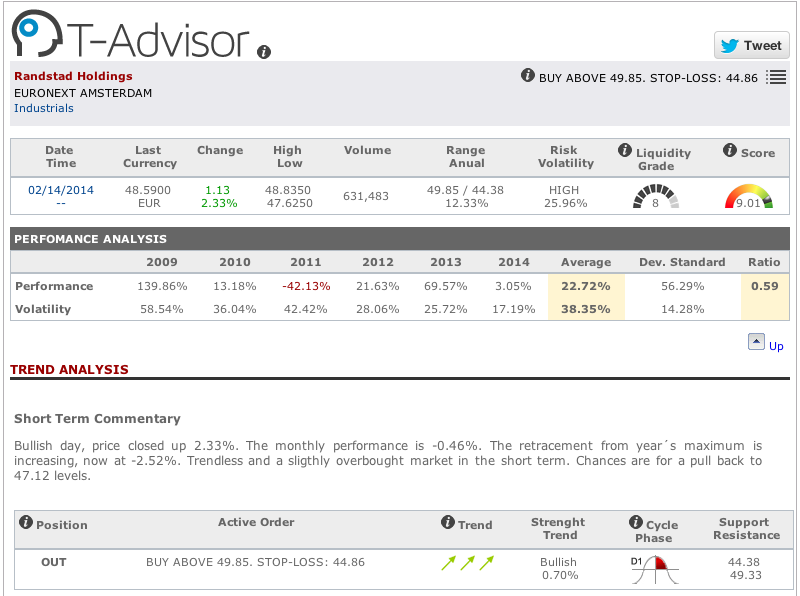 In any case, investment trends detected by T-Advisor tools show that PIIGS markets were in January, at least, pata negra. This entry was posted in News and tagged Bailout, Bullish, PIIGS, Troika on February 11, 2014 by Oscar Garcia. 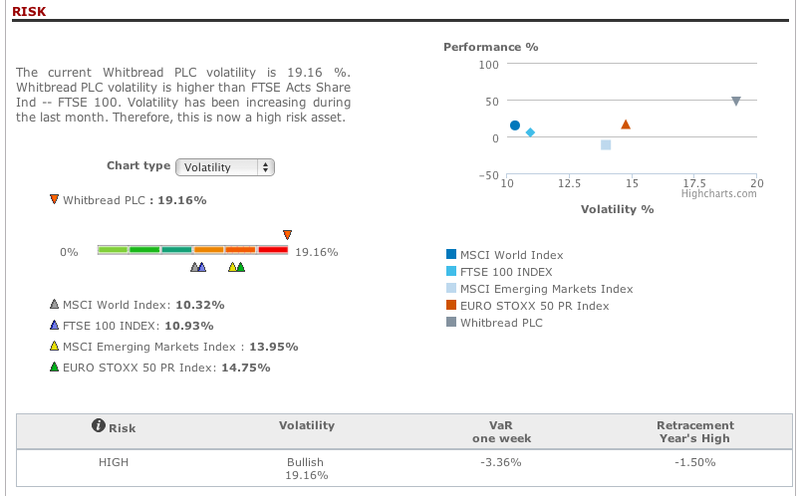 T-Advisor, through its tool Market Opportunities, has detected the company Whitbread PLC, listed in London as an opportunity for investment. Whitbread is the UK’s largest hotel, restaurant and coffee shop operator with 40,000 employees. Its business is diversified in six brands : Costa, Premier Inn, Beefeater Grill, Brewers Fayre, Table Table and Taybarns. This entry was posted in Market Opportunities and tagged Investment, Opportunity, Whitbread on February 10, 2014 by Oscar Garcia. Monetary policies in some countries experience a deep change after some years of relax due to the financial and economic crisis. US Federal Reserve is the machine in this movement. The announcement in December that the central bank reduced its debt purchases (broadly known as Quantitative Easing), originally focused to avoid deflation and promote an economic improvement, provoked an earthquake in the emerging markets. Why? Well, there were already signs in August, but these countries are now less attractive as the US bond rate outlook tends to increase. Possibly, the 1997-98 crisis will not repeat, as emerging markets have other strengths, but instability will be the next months’ market behaviour. US Federal Reserve will tend surely to continue its tapering in a slow pace, but markets take into account that this year will be the last one with quantitative easing. Dollar will tend to be stronger and US bond will tend to increase. At the other side of the Atlantic Ocean, the ECB will tend to keep a flexible monetary policy, as Mr. Draghi observes some deflation risks. The open question is if the European Central Bank will act surprisingly as it did in November with an unexpected rate cut. These changes in the world capital flows will have a deep impact in emerging markets. Investors should look for the best information to react immediately and avoid possible losses in their portfolios. This entry was posted in News and tagged ECB, Emerging markets, Federal Reserve, Quantitative easing on February 4, 2014 by Oscar Garcia.